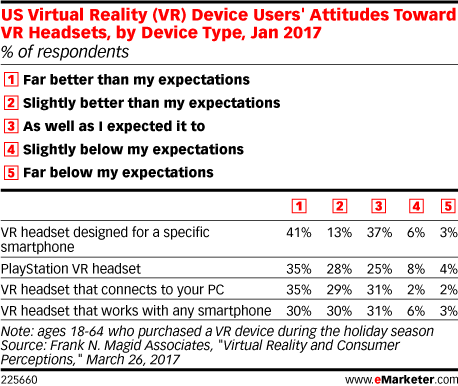 Data is from the March 2017 Frank N. Magid Associates report titled "Virtual Reality and Consumer Perceptions." 1,000 US internet users ages 18-64 were surveyed online in January 2017. All respondents participated in at least one of the following activities weekly: watch live or recorded video on a TV, desktop/laptop or mobile device or play games on a desktop/laptop, console or mobile device.